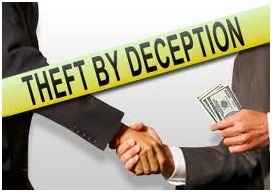 Theft by deception is defined as "[a person] purposely obtains property of another by deception." Commonly referred to as "conning," this is a very serious offense that has severe ramifications. If charged with this offense you should contact an experienced legal representative. LS&P Lawyers are available 24/7 for free consultation and has offices conveniently placed in New Jersey. There was a monetary gain or loss involved between the defendant and victim. Deception could mean a number of things. Creating a false impression of the law, value, or intent of something constitutes deception, such as one pretending he is donating funds to charity but in reality is keeping them to himself. This person misrepresented his purpose in collecting money, so he deceived anyone willing to give him money for charity. Similarly, if one promises to perform services for money and those services were not rendered, said person could be charged with this crime. However, puffing and exaggerations are not covered by this statute. For example if a salesman makes a statement regarding the quality of his merchandise, this is regarded as an opinion rather than a legally binding promise. So if your wife does not like the piece of jewelry you got her after the jeweler said she would, you cannot accuse him of theft by deception. Theft by deception can have very serious punishments depending on the amount conned. A person is charged with a second degree offense if the amount stolen sums to over $75,000. This person can then face 5 to 10 years in prison and a $100,000 fine. If the amount stolen lies between $500 and $75,000, this amounts to a third degree crime punishable by 3 to 5 years in prison and a $15,000 fine. If the amount stolen lies between $200 and $500, this amounts to a fourth degree crime punishable by up to 18 months in prison and up to $10,000 in fines. It is important to note that in a continuing scheme all theft amounts are added together to determine degree of crime. However, an individual cannot be charged with the entirety of a large-scale operation, only the part of the scheme for which he was involved. If you are facing these charges please contact LS&P Lawyers for a free consultation. Our experienced New Jersey theft defense lawyers will represent you to the best of their ability.